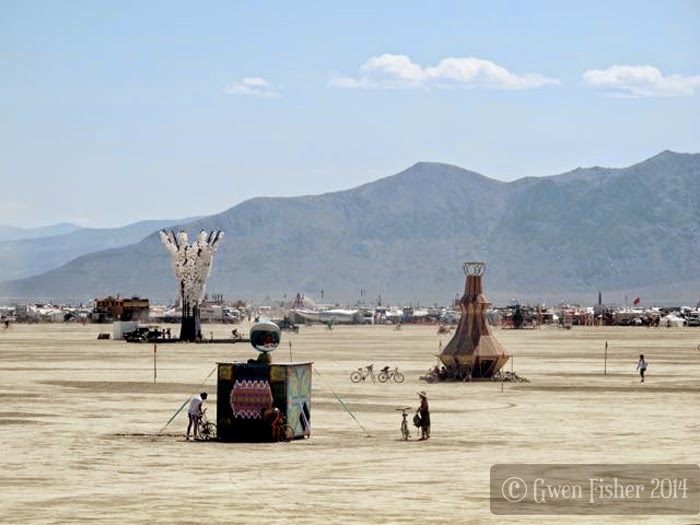 I recently returned from a long epic journey, camping in the Nevada desert, and making large art for the Burning Man Art Festival. 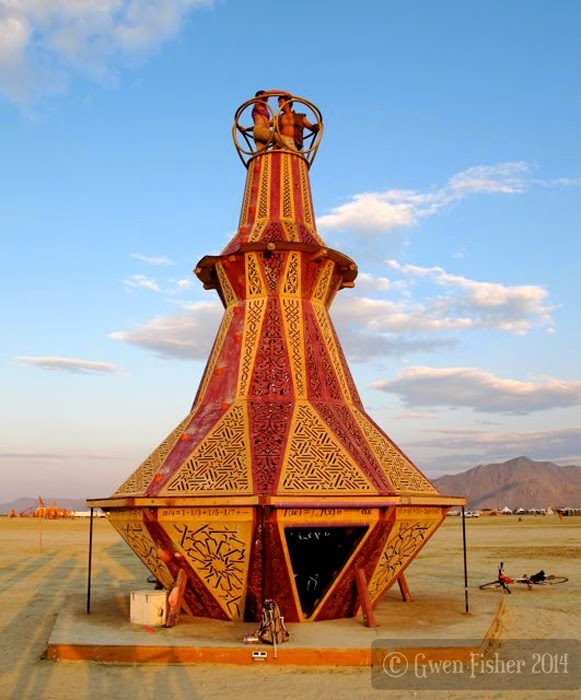 I was the lead artist for a 25 foot tall Genie Bottle, a furnished wooden gazebo and climbable sculpture made by a crew of over two dozen people. 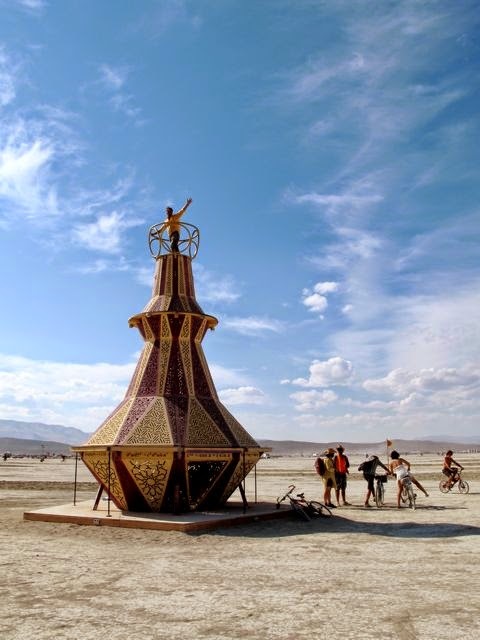 The Genie Bottle was supported, in part, by a grant from Burning Man. 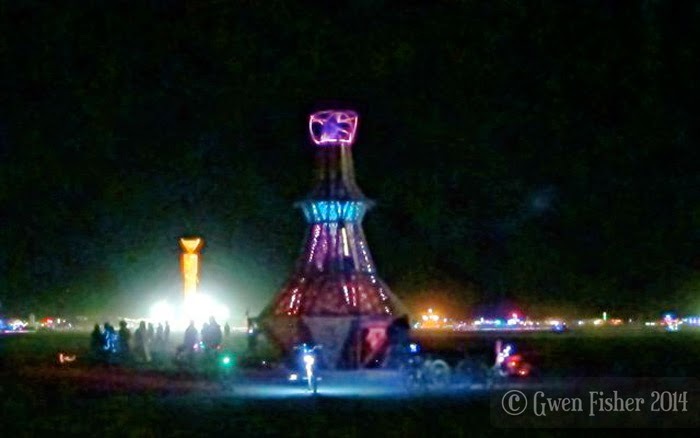 I worked on the Genie Bottle most days in some way since April, including 13 nights on Playa. 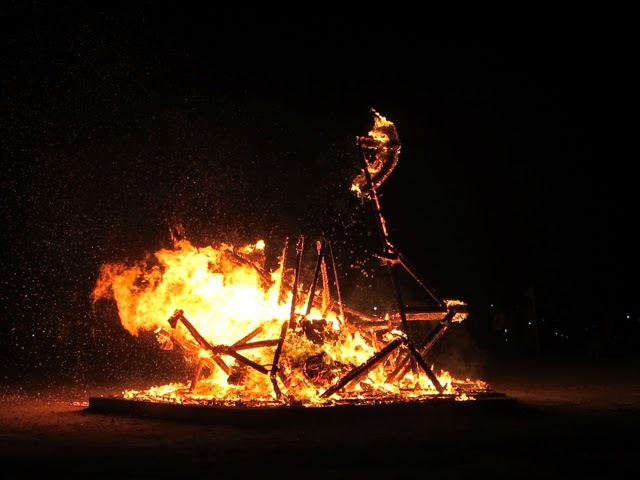 Last week, my friends and crew mates burned down the Genie Bottle to ash, and we cooked s'mores over its smoldering hot coals. 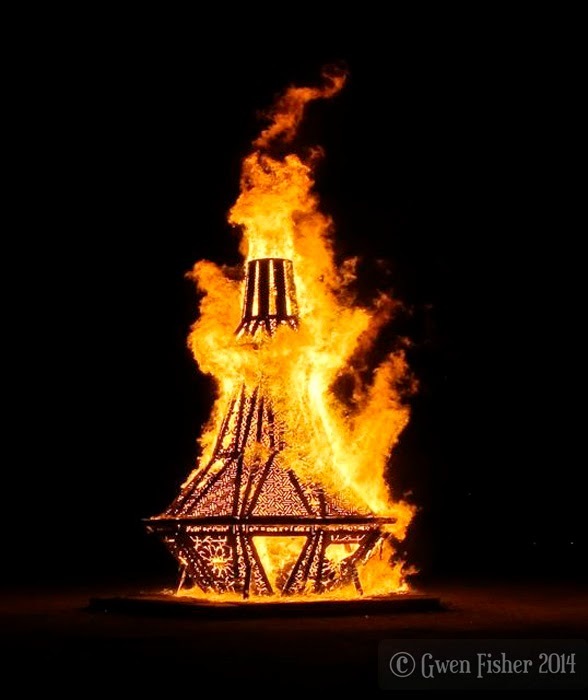 That was five months of creation burned away in less than a day. The art was ephemeral. It was a study in detachment. However, not everything about the Genie Bottle is gone. 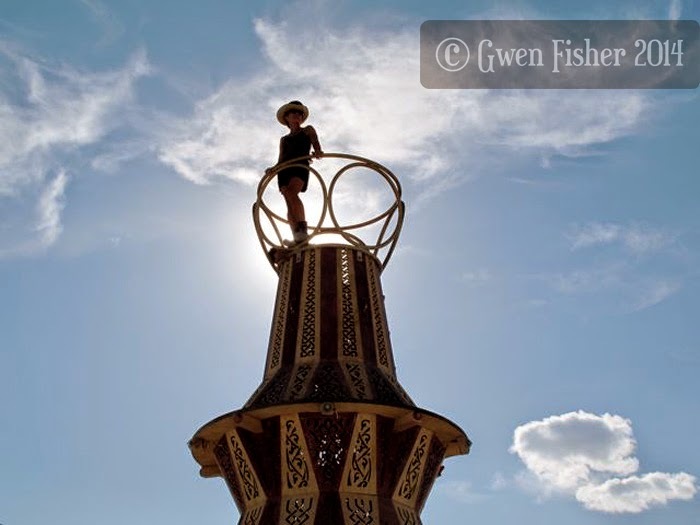 There remain numerous artifacts, including stickers, buttons, photographs, pillows, tassels, and the countless memories of festival goers who climbed in and around the piece, sat inside on its couch, enjoyed its light, danced on its pole, and watched it burn throughout the dark night. Here is what it looked like at night. 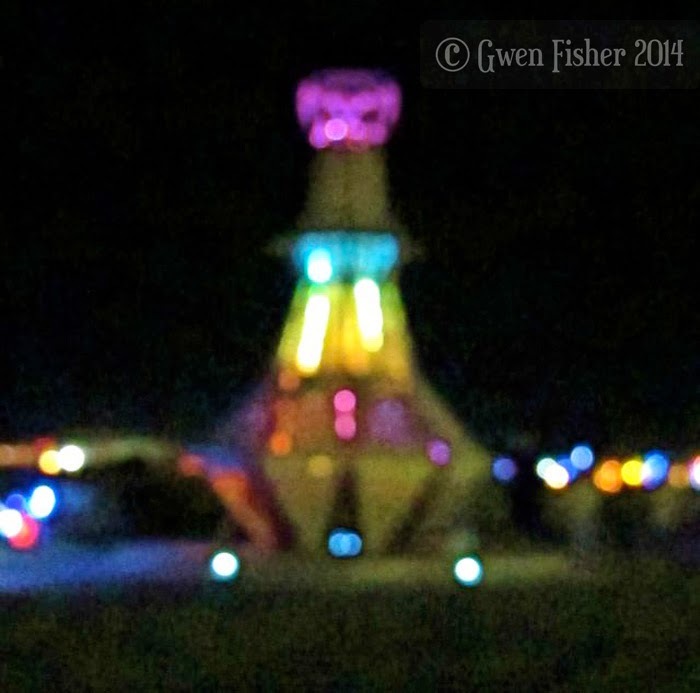 It's a blurry photo, because that's how I remember it. Here's a clearer shot with The Man in the background. This was the interior design. Zelda Lin was chiefly responsible for leading the interior design crew. She created those stencils on the pillows specifically for this project. 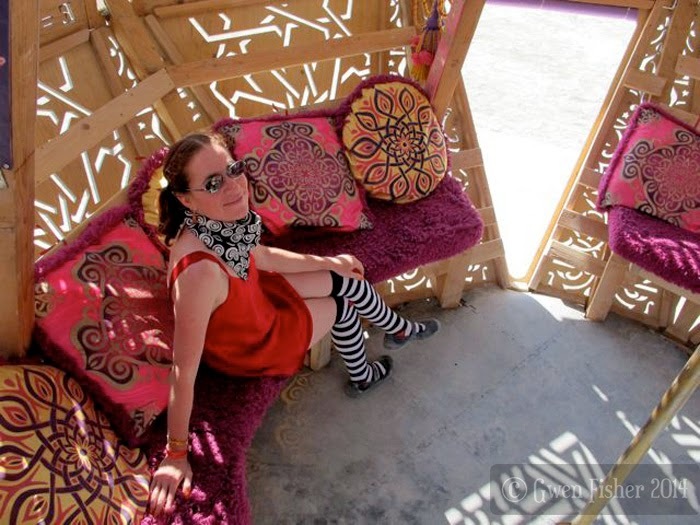 Sarah Leyrer painted the "By Struggletent" and other signs that decorated the interior. You'll be happy to know that we removed the pillows, cushions, tassels, lights and signs before we burned the bottle. The Genie Bottle had 20 facets per layer and 7 faceted layers, so a total of 140 facets. 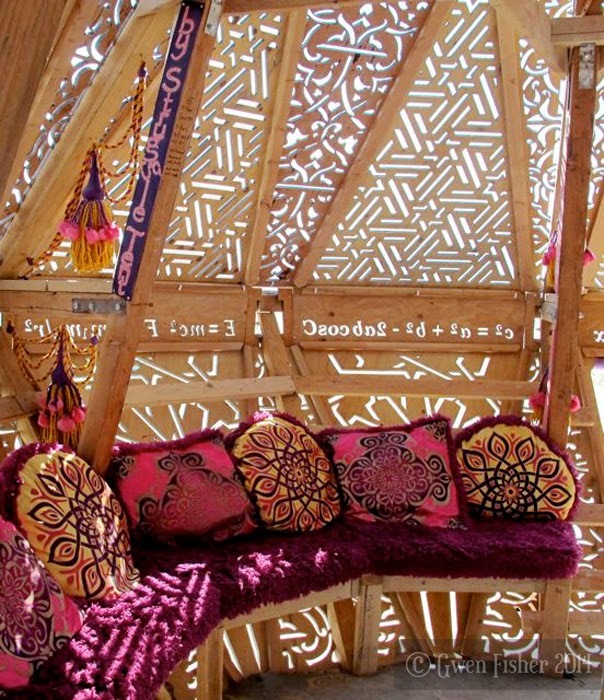 Of these, 120 were laser cut with arabesque designs designed by Marty Kenney. 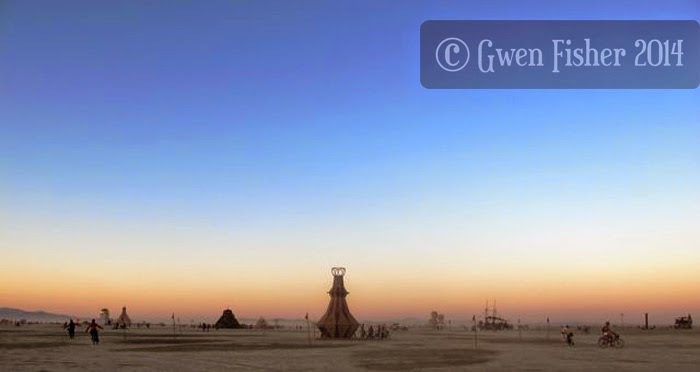 The Genie Bottle stood 25 feet into the air. It weighed approximately 4500 pounds, with about a quarter of that weight in the pentagonal deck. The deck was bolted to the ground with 10 long ground anchors that took a special machine to hammer them into the ground and remove later. We had to bolt the piece to the ground to keep it from falling over in high winds or when people climbed on it. 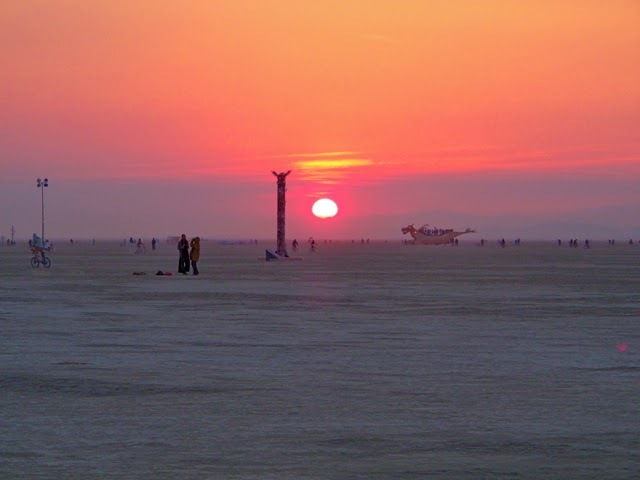 People climb just about everything at Burning Man, so it was important to make it safe. We could see the genie bottle all the way from our camp, which was maybe a half mile away. (This photo was not taken from our camp.) Here on the horizon, you can see The Temple and The Volcano on the left and Embrace on the right. 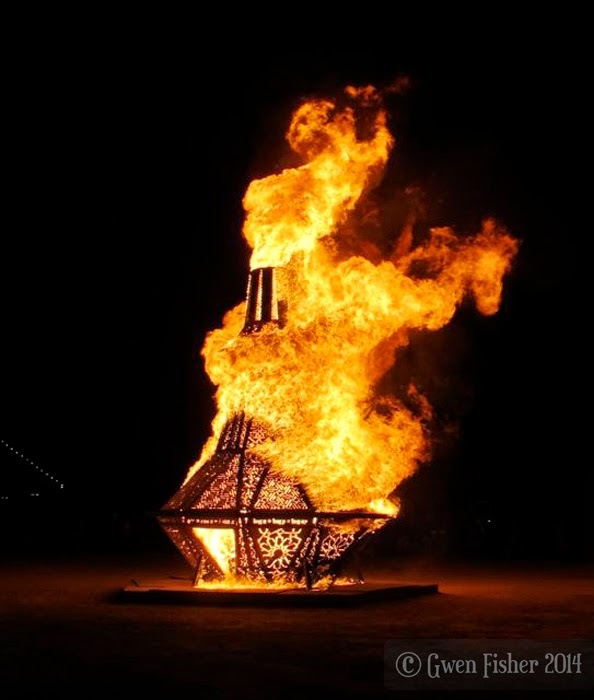 We set the Genie Bottle on fire on a Friday night at Midnight. We removed all of the interior decorations, the crown on top and the steel pole in the center. We loaded it up with fire wood. We strategically cut into some of the main struts to help control how the piece fell. Then about 20 people formed our fire safety perimeter crew, led by Greg Whitehead. We made a circle about 63 feet away from the ground deck in order to keep watchers at a safe distance. 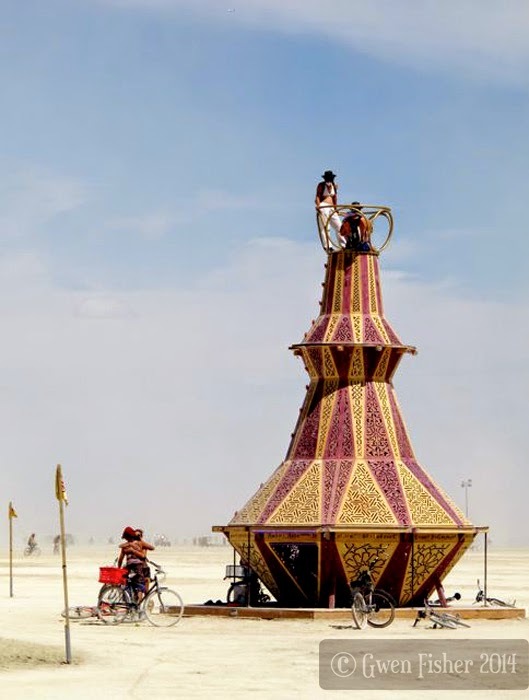 By this time, a few art cars had parked and a couple hundred people waited patiently for the burn to start, Mike Ryan added a few gallons of "accelerants" (that's a fancy name for diesel fuel). Then Paul McGlaughlin threw a couple flares inside to ignite it. The burn started with a BANG! 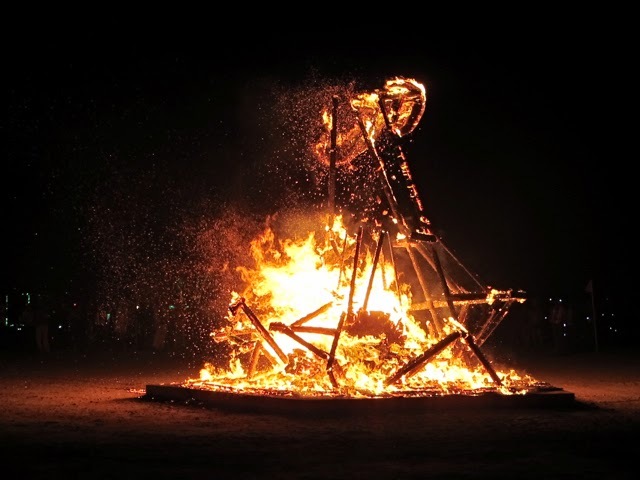 More people amassed like moths to a flame. 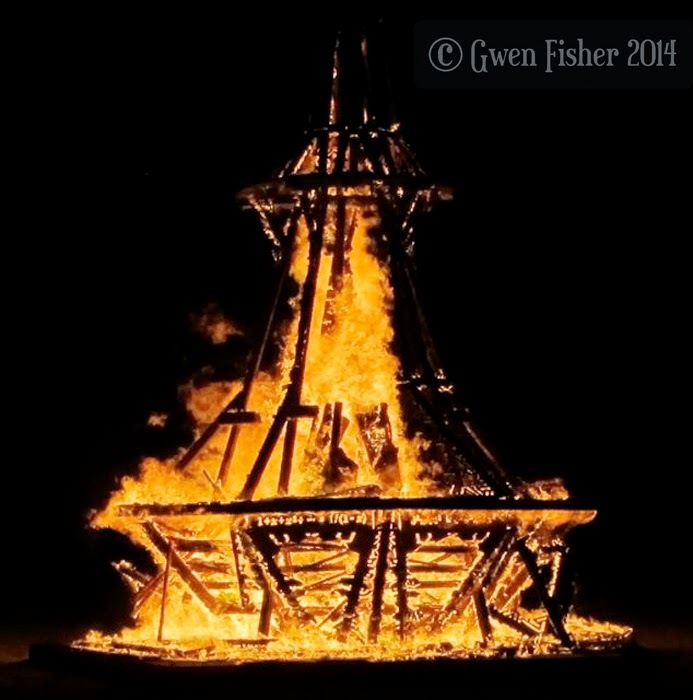 Within minutes, the entire structure was engulfed in flames. The laser cut, 3/4" plywood burned off first, revealing the 2 by 4s, 4 by 4s and the two upper decks. Eventually, one of the main struts failed, and the washer deck (16 feet up) came crashing down to the ground. It fell beautifully, with only one large beam falling outside the pentagonal base. And then it came down completely. 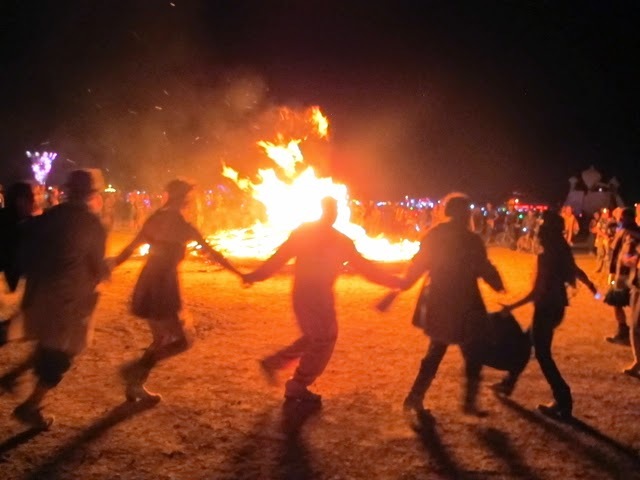 Once our safety perimeter was released, a line of revelers danced circles around the fire. Here's a little video to give you a sense of the mood when the perimeter dropped. I simply spun around in a circle so you could see all the things going on. Forgive me if it makes you dizzy. Next time, I promise to bring a tripod. The fire burned all night, and a small group of us stayed up to watch and tend the fire. Once the fire died down enough to get close to it, we made do-it-yourself s'mores. Dawn broke at about 7 AM with a red sun. 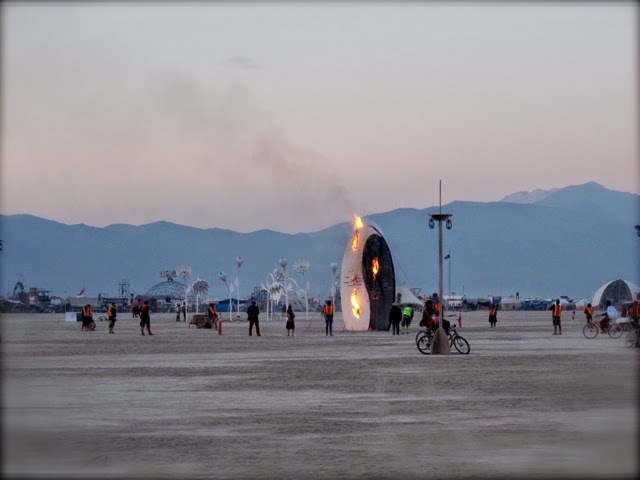 Then the Yin-Yang near us was set on fire. 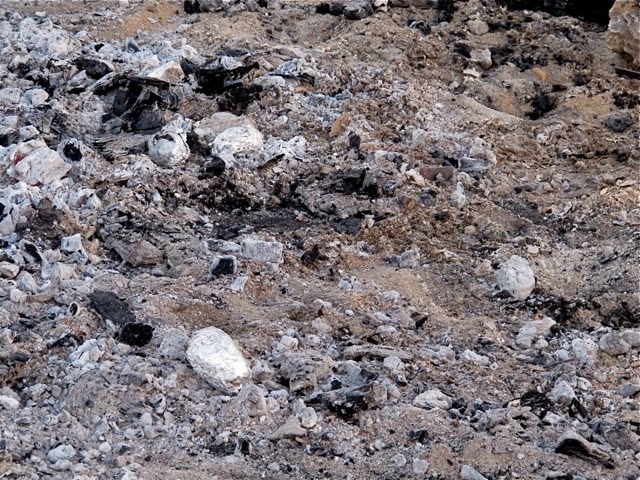 And then at some point, I looked closely at our pile of coals and noticed foil wrapped potatoes. Potatoes. Somebody threw potatoes into our coals when we weren't looking. Nobody tending the fire saw who did it. I ate one. It was a little dry, but I appreciated the thought. Then I headed home and tagged in our Leave No Trace Crew to clean up the mess: coals, metal bits, and thousands of screws. And potatoes. Susan Staley and Mike Katell lead the crew of mighty genies (including Theresa Whitney-Corvino, Sarah Leyrer, and Marty Kenney). They didn't finish until 3PM. Next time, we need a larger crew to help. The Genie Bottle was a creation by an intentional community, collectively known as Struggletent. We are multifaceted in our skills and contributions. 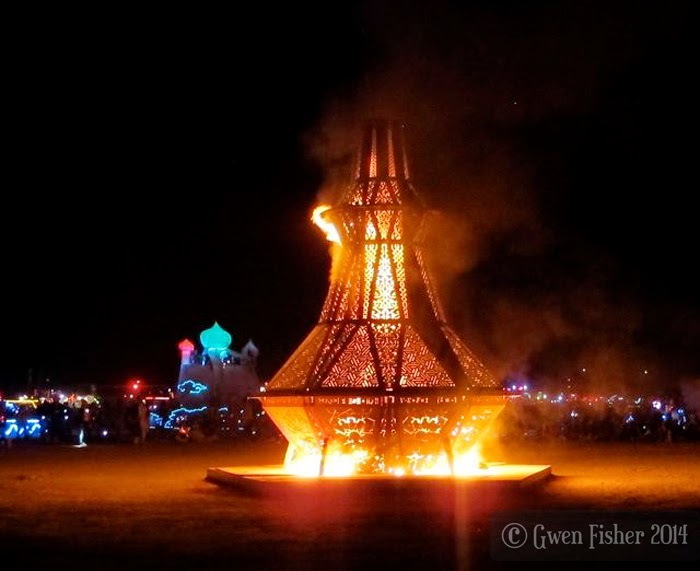 Over two dozen "strugglers" helped with the Genie Bottle at some point along its creation and burn. Many new friendships between crew members were created, many old ones were strengthened and, sadly, a few are now broken. Through the ups and downs of this project, I learned a lot about my friends, and more about myself, and for these insights, I am grateful. I am also relieved to be home again, back to work, and I remain confident that I will continue to create beautiful and complex artwork for and with my community. 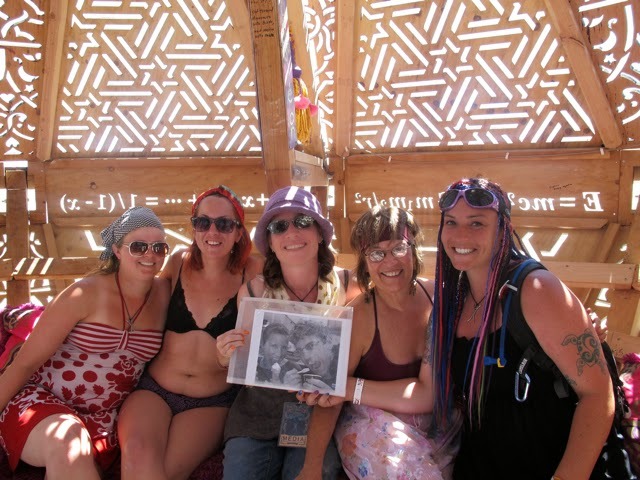 Here I am with some of my fellow genies. Christy Burback, Susan Staley, me, Theresa Whitney-Corvino, and Danielle Deckard. All of these women did more than their fair share in this project. Thank you ladies! 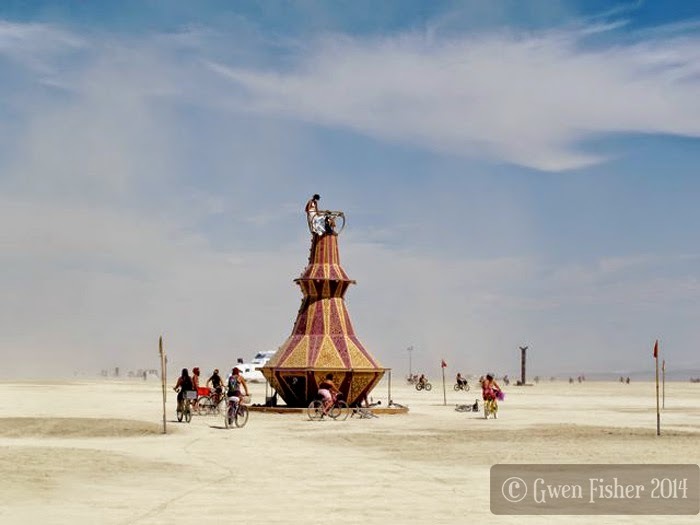 This is Paul Brown at the top of the Genie Bottle. He was the chief engineer for the Genie Bottle. Without Paul, this project never would have happened. He was the one that turned my sketches into workable plans, with everything specified to the nearest 1/1000th of an inch (a mil) and 1/10 of a degree. This is me, lounging on the couch inside. Congratulation and kind regards from Upperfrankonia (Germany). One of my favorite pieces this year ~ thank you! Stopped by countless times to rest/reflect. A truly amazing piece of craftsman/womanship. Great pictures! The math and physics equations are mostly English, with a few Greek letters here and there.